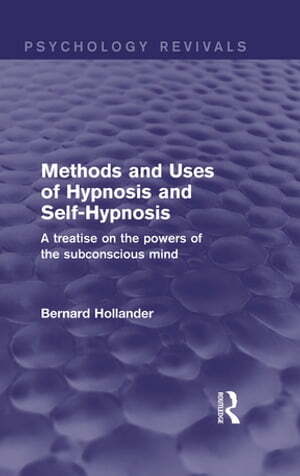 Collins Booksellers - Methods and Uses of Hypnosis and Self-Hypnosis (Psychology Revivals) by Bernard Hollander, 9781317487159. Buy this book online. Originally published in 1928, the main object of this book was to draw attention to the importance of hypnotism and its phenomena, in order to stimulate inquiry into what was at the time a ‘mysterious and unexplored subject’. The author had studied hypnotism nearly all his life and practised it for thirty years, he therefore felt the investigations, experiences, and views presented in this title would prove of interest and value both to the medical and psychological expert and the general reader of the time. Today it can be read and enjoyed in its historical context.